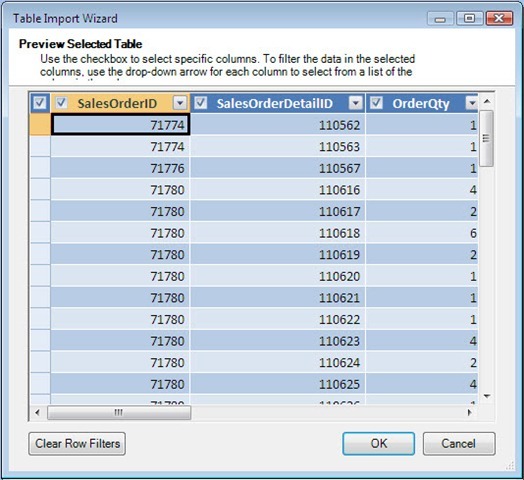 PowerPivot has the ability to import data from a wide variety of sources. But you could run across a situation where you don’t have that data stored anywhere. Perhaps it’s on a piece of paper, or in a text file, or it’s just in the user’s brain and needs to be typed in. Logically then you would want to create a new table in PowerPivot. Except you can’t. PowerPivot itself doesn’t provide the ability to create tables and enter data directly into it. Now, before you start the usual rending of garments and gnashing of teeth plus a little wailing, there is a simple to implement solution. Create a new Excel 2010 workbook. In sheet 1 (or any sheet) let’s enter the following information. Now highlight the above cells and Copy them to the clipboard. Next, launch the PowerPivot window by going to the PowerPivot tab in Excel 2010 and clicking the PowerPivot window button. Once PowerPivot is open, if you look in the middle group of buttons you’ll see a set named Paste from Clipboard The To New Table button should be activated now that you have data in your clipboard. Click the To New Table button. When you do, the Paste Preview dialog appears. This is similar to the preview window you see with the Import Table wizard, only not quite as much functionality. Here, we can view the data and validate that it is correct, which it is. We can also indicate if the first row contains our column headers, which in our case it does so we can just leave that option checked on. Click OK to import the data. Above is our new data, now pasted into PowerPivot. We have the same abilities with it we have with any other table, we can sort, rename our columns, add new calculated columns, and more. As you will note from the tab at the bottom of the picture, the data was pasted into a table with the rather uninformative name of Table. We can do better than that, so right click on the Table tab and pick Rename from the menu. Overwrite Table with CountryInfo. 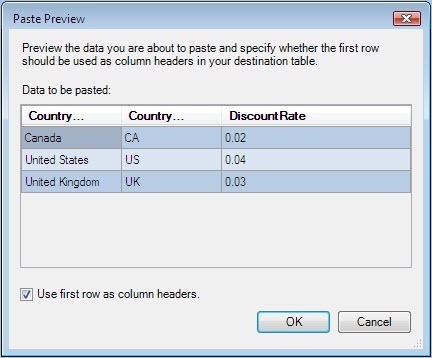 Now you can see how easy it is to create new data from scratch and paste it into PowerPivot. In this example I used a limited number of rows for illustrative purposes, but it’s quite possible to import massive amounts of data. In addition, you can add to your table later. In this example all we would have had to do is Paste Append from the toolbar. In the next blog post we’ll build on what we’ve learned and look at how to combine data imported from multiple sources. PowerPivot has the ability to import millions of rows of data into Excel 2010 for purposes of analyzing, slicing and dicing. However, even though you can import vast amounts of data you may not always want to. There are many reasons for this. You may wish to limit the amount of data for security reasons. Perhaps bringing in all of the data may put an unneeded strain on the server. Most likely though, is you simply do not need all of the data. As an analyst you may be interested in only the data for a segment of your organization, such as a single plant or department. Fortunately filtering data is an easy task. If you are not familiar with importing data into PowerPivot, may I suggest you first review my step by step posted yesterday. Launch Excel 2010 and go to the PowerPivot tab, then launch the PowerPivot window. 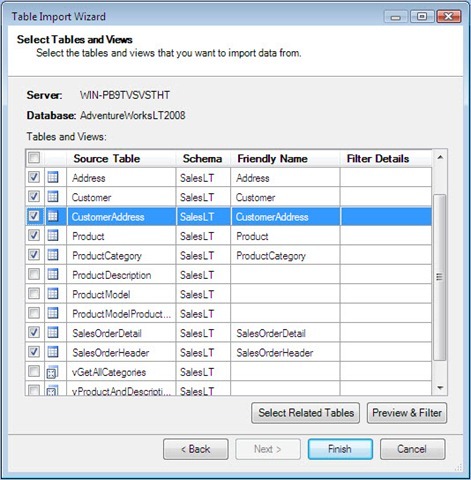 Select the "From Database" to start the import process, and for this example we’ll use SQL Server. Now, like in my previous blog post enter your credentials to connect to a SQL Server. For this example we’ll just pick one table, SalesOrderDetail from the AdventureWorksLT2008 database. With the SalesOrderDetail picked, look in the lower right side of the dialog. You will see a button labeled "Preview & Filter". When you click that button you should see a new dialog appear. Here you can see a subset of your data, only the first few rows. It’s enough to give you an idea of what the data looks like, but it won’t show you every single row. Considering the fact that PowerPivot is capable of importing millions of rows, this is probably a good thing. Within this dialog we can do some pretty powerful things. Let’s start by eliminating a column we don’t need in the data we want to import. Scroll to the right until you see the rowguid column and uncheck the box next to the column header, as you see below. By unchecking this box this column will not be imported into our Excel 2010 PowerPivot table. Recall though that the name of this dialog was Preview & Filter. We can also do some review of our data to ensure it’s what we want. Let’s say we want to look to see the range of values for our line totals. 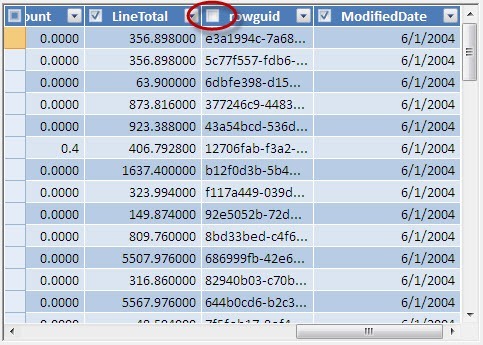 Click the downward facing triangle button to the right of the LineTotal column header. A drop down menu will appear. 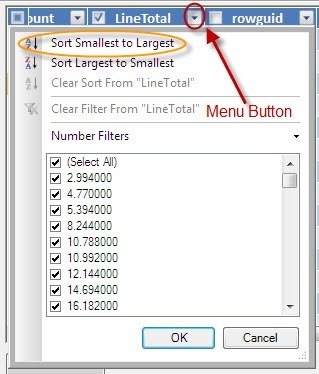 Select "Sort Smallest to Largest"
Scrolling through the data you’ll notice that the data has indeed been sorted. Also note the menu icon to the right of the column name changes to indicate a sort has been applied to this column. (Remember though it’s not showing all rows, just the first few sorted in order.) An important thing to note tough, this sorting applies only to the data as you see it in the Preview & Filter area, once you click the Finish button on the Table Import Wizard the sort is removed. While the preview options in this dialog are not saved, filters are. If you had pressed Finished, you’d have seen that rowguid is not included in the result set. But don’t click Finish yet, we’re not quite done filtering. For our next filter, let’s decide for purposes of this report we are only interested in large orders. We’ll define large as "Line Total greater than 1,000 dollars". 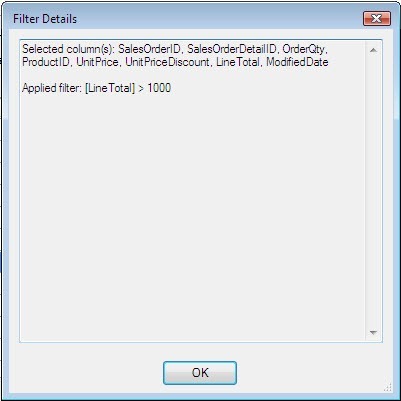 Once again open the menu to the right of the LineTotal column header and select "Number Filters". A pop out menu will appear, from it select "Greater Than…"
When the Custom Filter pops up, enter 1000 next to the is greater than box and click OK.
Clicking OK will reveal lesser amounts have been removed. Other filters besides numeric filters are available. For text data, you have "is equal to" and "is not equal to" available. Date filters work the same, having the "is equal to" and "is not equal to" available. I’m hopeful that for date types further functionality will be added in the future, such as date ranges or "is greater/less than" types of functionality. Let’s click the OK button on the Preview & Filters window to return to the Table Import Wizard. You’ll now see an Applied filters link in the row with the table name, click it to see what filters are in effect. While you cannot edit this information, it is nice to see it all in one location. Click OK to close and return to the previous window. Click Finish to complete the import. 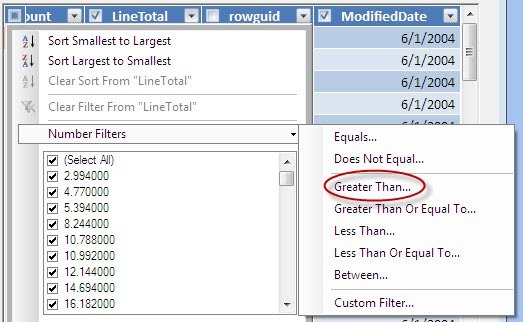 You will see the data you asked for, only rows with LineTotal greater than 1000 and without the rowguid column. 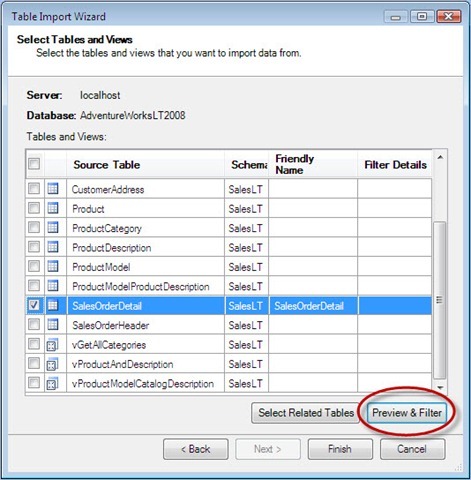 Hopefully you’ve seen how powerful the filtering tools included with PowerPivot are. Using them you can remove unwanted rows and columns, limiting not only the amount of data you have to pull across the network but that you have to store locally in the PowerPivot Excel 2010 spreadsheet. Limiting your data will ensure only the rows required for the analysis are included, saving time and enhancing security. Last Saturday I not only attended but presented at SharePoint Saturday Birmingham. First I have to give Terry Webster a shout out, he did a fantastic job organizing and running the event. I learned a lot, although I admit I felt a bit like a fish out of water, being a SQL Server guy in the SharePoint pond. Thanks too to all the volunteers who helped run the show, my co-presenters, and the many vendors who attended. Without the support of all those folks this event would not have been possible. I also want to thank everyone who attended my PowerPivot presentation. Last Friday I did a rather lengthy overview that encapsulated much of my presentation; here are the slides that you saw at the event. All you need are the first two items, Office 2010 Beta 2 and PowerPivot for Excel 2010 to reproduce what I did in the demo I presented. Next you’ll need some data. 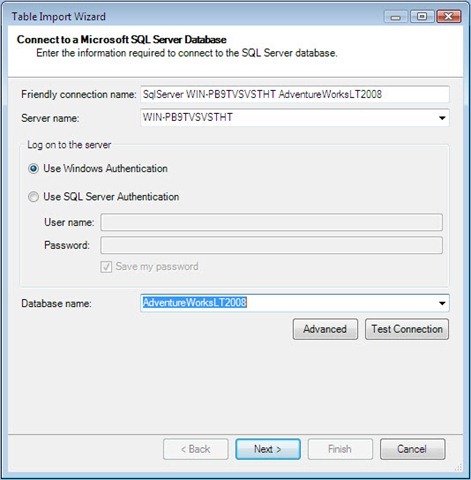 I had a SQL Server instance installed and used the AdventureWorks2008 LT database available at CodePlex. The LT version is the light weight version of the full AdventureWorks sample, I chose it for it’s simplicity. If you don’t have SQL Server on your box you can use alternate data, or check with your friendly neighborhood DBA. Many have AdventureWorks installed on a test box and might be able to help you out. OK, so to get this far you’ve downloaded and installed everything, and have access to a dataset. Ready? Let’s go. 1. Launch Excel 201, and click the PowerPivot tab. 2. Click the PowerPivot window button. 4. The Table Import Wizard will appear. In “Server name” field, click the drop down and pick your database server. Leave it set to the “Use Windows Authentication” (unless told otherwise if you are using a database provided by a DBA). Under Database name, pick AdventureWorksLT2008. It’s probably a good idea to click the Test Connection button just to make sure everything is correct. If so press Next to continue. 5. On the next screen, leave it at the default of “Select from a list of tables and views to choose the data to import” and click Next. 6. On the next screen pick these tables: SalesOrderDetail, SalesOrderHeader, Product, Product Category, Address, Customer, CustomerAddress. Note the “Preview & Filter” button. In the future you may wish to experiment with this to filter the data you are importing, but it’s not needed for this demo. Click Finish to move on. 7. On the next screen you’ll see it importing the tables. When it gives you the Success message click Close. 8. (Note, this next step differs just slightly from the live presentation, in it I added a column but did it in a different place.) Click on the SalesOrderDetail tab. Click on a blank cell under the Add Column out to the right of the data. 10. Right click on the “CalculatedColumn1” column header and select “Rename column” from the menu. The column header will highlight and allow you to type over it. Change the name to Profit. 11. 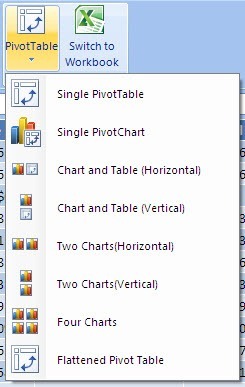 Click on PivotTable and pick “Single Pivot Table” in the drop down menu. 12. In a pop up dialog, it will ask if you want a new or existing worksheet. Pick “New worksheet” and click OK.
13. Over on the right you will see the “Gemini Task Pane”. Gemini is the original code name for PowerPivot. To create a basic PowerPivot pivot table, follow these steps. 14. Under SalesOrderDetail, click on then drag the LineTotal and Profit fields to the Values area. 15. Under ProductCategory, drag the Name down to Row Labels. 16. Under Product drag the Name to the Row Labels area. 17. 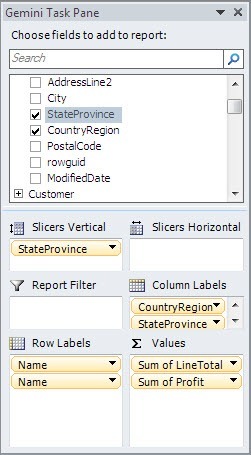 Under the Address, click and drag the CountryRegion, then StateProvince to the ColumnLabels area. 18. Drag the StateProvince to the Slicers Vertical area. At this point you have completed all of the steps as shown in the presentation. Now start playing. You can jump back to the PowerPivot data sheets by clicking the “PowerPivot window” button as shown in step 1. Back there you might try experimenting with a chart, or on the pivot table apply different effects and slicers. I’m currently at the SQL PASS Summit in Seattle Washington. At today’s Birds of a Feather lunch I’ll be acting as host for a table. Our subject is Full Text Searching and FileStreaming. If you’d like to learn more about either of these topics come on by, would love to meet you and see more of how you use these products in your environment.